Is Softricity a SBC product? In essential not, just like Wise Packager and that kind of tools are used in SBC environments but not specially made for a SBC environment. Why although a review of Softgrid? Because the concept of this product solves a big SBC problem often called as the DLL (sharing) hell. Softricity virtualizes applications, so the application will run in his own environment above the operating system. 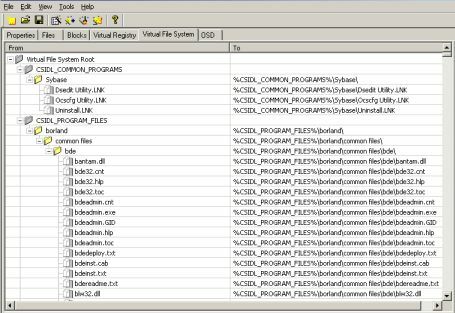 All needed files like DLL's, executables are placed in the virtual layer of the application. The application can use the underlying OS system layer but it can only read this layer. In this way there is no DLL intervention of the several applications on a Terminal Server environment and you can offer applications together on one server which normally can not operate if both are installed on the same server. Also upgrading your applications is much easier in comparison with normal installed applications, your just make a new sequence (the name of a application package within Softgrid), give it a higher version number, publish it and the job is finished. 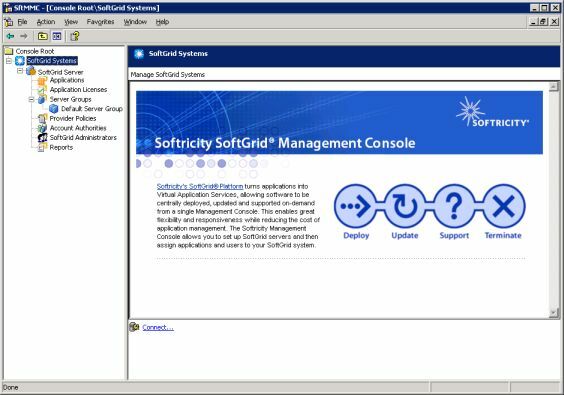 Softgrid is not an application which you install just pressing next next and finish buttons. Happily Softricity has a good manual about installing the Softgrid server. Because of this installation we are not describing the installation here, but will just mention some important point. You need a Windows 2000/2003 server with IIS, .Net Framework, MMC and MDAC enabled. You also need a SQL server (or MSDE database) to store the information in it. Also it is very important to have two groups in your AD, one for Softgrid Administrators and one for the Users. As described it is very important to following the installation steps in manual exactly. A Softgrid Expert has made a description for unattended installation of this server part, which you can find at www.softgridguru.com. Softgrid have also a client part especially for Terminal Servers. This is just a small piece of software, which can be installed unattended (described in a Softricity knowledgebase article). After installation the server part, you can start with "configuration". This means actually mostly sequence the applications you want to publish to your users (and some server optimization if necessary). Sequence is the Softgrid word for packaging the application. A separate application (the sequencer) is provided to make the sequence process possible. After filling in some information fields, the monitoring process is started. During this monitor part, you install the application if you would normally do. After the installation of the application you need to specify the executables which will be started by the users. These executables will be started by the sequencer. It is advisable to start the most used functions of that applications. Softgrid records at that moment which files are be used and will stream that first if the application is started. After the sequence you can add or delete files in or out your virtual layer of the application. Probably you need to add the OSD file manual (configuration file). If the sequence is OK, you need to add the sequence to the Softgrid environment using the Management Console. On the website are several recipes (manuals) how to sequence the application exactly step by step. Of course it is impossible to describe all options and possibilities of the sequence in here, just look at the recipes or attend a Softricity course. All management is done within the Softgrid Management Console. With this console you add the applications so they are available for the users. All other configuration options can be set here like license monitoring (and blocking), policies and other settings. Softricity has also a fine reporting possibility based on Crystal Reports. You can make reports on several objects like system utilization, user/group activitiy and system errors. One thing Softricity needs to improve are the errors. The error description is often unclearly and exists a long error string. If you search in the knowledgebase for this error string you can not always find a solution for that particular error. Softricity streams the applications to the workstation or terminal server using the REAL protocol. Softgrid streams the started executable and corresponding files (in the sequence) first, so the user can work with the applications quickly. In the background the other part of the sequence will be streamed to the system. Users will see a launch bar with the progress of the streaming in the right corner. On a Terminal Server it is a very good idea to cache to full stream, so the application starts quickly. After the application is launched the user does not notice in some way that the application is working virtual. A logical limitation of this concept is that applications are separated from each other (each applications runs in his own virtual environment). If Application A has an option to start Application B (for example an application which make reports using MS Word) the application can not find application B installed. This can be solved in two ways. 2- Make application B part of the operating system. Depending on the kind of application you can choose the right option. Reminder that option 2 means that this application is installed in the traditional way, with the traditional problems. The idea of Softgrid is tremendous. Running the application in a virtual environment has lots of advantages (certainly in a SBC environment). Although Softgrid has some limitations and his own attributes we are impressed by the product. Of course you need to learn the product for a while, before you are completely aware of all possibilities. It is a pity that you need a big server environment and the product is pretty expensive.